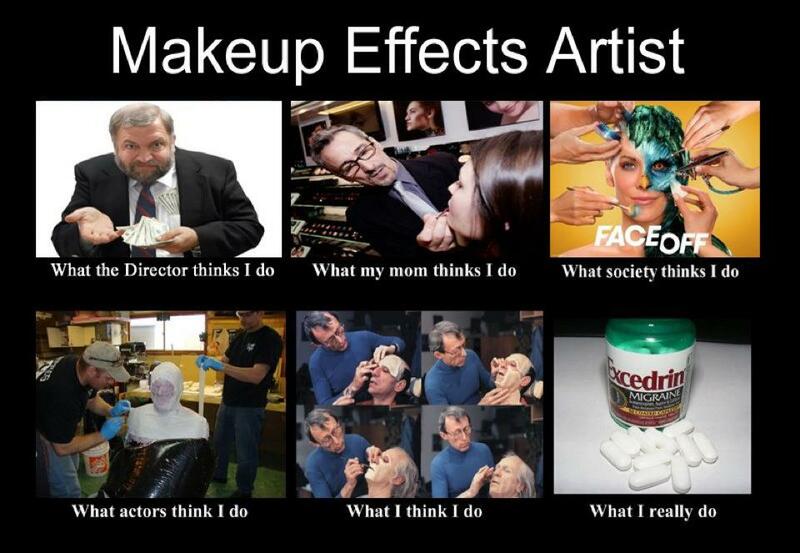 So you want to be a Makeup FX artist? Pt 1. Where Do I Start? So, you have been doing what you are doing for a while, life was going ok, good, not great, and you have slowly come to the realisation that you have a niggling dream to work in Special Makeup FX…. Or perhaps you always knew you wanted to try for this, but you never quite knew how to start? You might be twenty and single, footloose and fancy free, or you might be married with a mortgage and kids…. I do empathize with you- I didn’t get into this until I was 40, and let me tell you it took me about three years to work up the guts to do it!! I flipped everybodies lives upside down in the process, because I had to move to the other side of the country for three months to train, and previously I had been home with my kids while they were little, so my husband suddenly had to rediscover (discover?) his domestic side and hold the fort whenever I was working! Fortunately for me though he realized I needed to do this and saw how much happier I was once I had so it all worked out, not everyone is that lucky. Also we have money from our other business so I can afford to just do the jobs I want- never had to take weddings to pay the bills. http://www.stanwinstonstudio.com/home.html Go to the FAQ. Because there is totally inadequate education in these areas, I am actually in the process of developing a book on this and related areas. I have taught a few short courses on the basics and frankly I was horrified at the lack of basic general film knowledge out there when these schools toss people out into the real world- and not just in the Makeup Dept but from people with three year film or media degrees……. Even when people teach themselves without the benefit of formal training, as have many of the top people in the industry today, you are only as good as the information you get and the people who inspire you- who are your influences, and how good are they? If you can’t name five of the worlds current most influential makeup fx artists, and five of the pasts best, then ask yourself seriously if you really know what you are doing trying to get into this business…. Film is not a glamourous job, except maybe for five minutes once every couple of years, it is hard graft and dedication. First thing I need to ask is something many never think of- had you ever been on a filmset prior to doing your course, or did you get to go onset during it? What did you think about that? I find people usually love it or hate it. You can either cut it or you can’t. Have you ever considered that in special effects the greatest portion of your work will be for film or tv or commercials, and all that that involves, with tight deadlines and even tighter budgets? -if you are onset, it is having the people skills to deal with producers, directors, actors, and other technical crew. Being a self motivated individual but also a team player. -if you are interested in Practical FX then you need to deal with people. If you want to do Makeup FX you need to be great with people. You are dealing with actors who are expected to go out and turn it on for the cameras, and your job is to make it easy for them to do their job, even if you have just spent several hours covering them with uncomfortable appliances and glues or paint and makeup. And then you have to clean them off afterwards without taking off the top layer of skin… oh, and you will usually be doing this at 4 in the morning in freezing conditions, or else in the middle of the afternoon in 37 degrees Celsius where everything is melting off them and you spend 90% of your time mopping up the inconveniently placed real sweat and applying fake sweat in the correct amount in the correct places! Over the last decade the whole film industry internationally has been in a bit of a hole due to the global economic climate. Yes, there are still films being made, but even in the US with its massive population their production has been lower than usual and finance harder to come by. In most places therefore there have been far fewer large budget films happening and most of what has been made is low to no budget (anything under five million) and even the commercials and advertising side has been fluctuating, which impacts severely upon the number of fulltime crew the industry can sustain. Fortunately things are starting to pick up for people at a pro level in some places, like the UK, since the GFC stabilised. But a lot of Australian and European crew still have to resort to Plan B in most cases to get by – as the saying goes- dont give up your day job. Now Im going to have to tell you some truths you probably don’t want to hear. For the first couple of years you need to get real experience- onset, and you are going to have to work for free, or if you are lucky, for materials cost, to start with. That is part of your training, and must be considered necessary. You are unlikely to get any work assisting a professional unless you happen to know someone in a position to help you out- when we are on a job it is not the time to be trying to train people, and if you have to constantly stop and supervise and check and inform you cannot do your own job… Harsh reality. Likewise, no professional production company will allow people to get work experience for free onset due to the rigid requirements for insurance- it costs them money and they simply wont do it. There is no studio system, no apprenticeship system, no on the job training. Anyone you have around has to pull their weight from Day 1. You need to get onto student films and low budget/no budget productions where they cant afford a real pro who will charge according to their skills and experience, and you work your way up. Be nice to everybody- you never know where they are going to be, or what position they may have, in five years… the runner you chat with today may be a director or producer with the power to hire (and pay!) you in a fairly short time! Once again, something nobody likes to think about but that is more true than you want to believe- in this business it is not what you know but who you know. You can be the most talented person in the world but if your are a pain in the arse you will not get work. At least, you wont get asked back again.. Conversely, you may not be the most gifted technically but you may be consistently able to produce results on time and on budget, a great team player and a nice person to stand beside at three in the morning after a 16 hour day in horrible weather, and people will remember that, and ask you back for their next project! This is a VERY small industry. Not just in city to city, or even countrywide, but worldwide. People talk. If you are good, word will get around, and people will start to search you out for work. If you are not, likewise word will spread… Don’t lie to get work, either. Don’t steal other peoples work and try to pass it off as your own. It WILL come back and bite you. But at the same time, don’t allow yourself to be taken for granted, when you get confident and experienced enough to know what you’re worth, don’t be afraid to say so. And always educate yourself about proper industry working conditions and hours. Get the relevant industry information (in Australia its the Motion Picture Production Agreement) off the net and read it. Know your rights. Low budget should not be an excuse for low standards. Right, thats your reality check. If you can get through all of that and still be keen, then read on! I know it may sound insurmountable, but its not. You just need to be able to focus your energy in the right areas and work your way up to it. If it really is a passion, you will get there. And ask yourself- honestly, WHY do you want this? Most people find that when they look deeply enough, the answer they find is not the one they thought it would be. Me, I don’t want be famous, I don’t want to be the best in the world, just the best I can be. But I love making magic. I love taking something that was meant for something else and creating a thing that didn’t exist. I love the alchemy that comes from a group of passionate, dedicated people working to a common goal, and how when we get it right, when the magic happens, together we create something that explodes off the screen and takes on a life of its own. THAT’S why I do what I do. That’s my reward…. You will jag it maybe once in every ten times, but its worth it…. First if you arent already on Facebook, join. Its brilliant for meeting people, even in a virtual sense… and the vast majority of the Makeup FX industry worldwide are on it, accessible in a way they would never be in the real world- who has time to answer a million emails? If you are looking for a great resource and helpful technical advice, go and join Neill Gorton’s Makeup FX 911. And dont give up, remember there are no shortcuts, you simply have to do what you can, with what you have, where you are right now. No matter how small and insignificant that seems right now. if you know WHY you are doing this, if you can imagine how you will feel in twenty years, looking back on a successful career, and aim for THAT feeling, then you will get there eventually. Just keep the end goal in mind and let go of needing to know how and when you will get there. The world has a wonderful way of presenting opportunities to a person who is open to chance. I know this for a fact- I have had so many wonderful opportunities present themselves that were WAY better than anything I could have dreamed up, when I was trying to achieve things, with my habit of a logical, practical, and eminently sensible approach I would have discounted such things as impossible… and yet they happened, despite me! For those of you with a scientific or medical background, or who aren’t into the whole metaphysical New Age-y feel-good “you can get anything if you just believe” school, my best explanation for this is that technically its because your reticular activating system kicks in and stimulates your attention when you encounter something you have a high current awareness of- the way you buy a new car and suddenly become aware how many of them there are on the roads- they were always there you just didn’t need to notice it before. Same with goal achievement- when you focus on something and let go of needing to control the details of how it has to happen and in what way and by what time, you will be able to see other possibilities that you were previously oblivious to because in a way, you were trying TOO hard and only focusing on one way of getting there. When you concentrate on the feeling you want to have at the end, and less on how to achieve it, there are many paths! Meantime, you need to make enough to live on. Many people will need to do straight makeup like weddings and events for non-film purposes just to pay the bills. It is a double edged sword. Firstly you can make a decent income and get regular work that way but it requires you to book dates months in advance which then reduces your opportunities to work on film and media, which os usually at very short notice. This is also the issue with having any kind of ‘day job’- you need a sympathetic employer. Is there anything in your previous field of employment that you can do, like temp or casual work? If you are just out of school or still studying you are going to have to choose a job you are happy to do for the next few years while you get established. Can you afford to specialise? Or will you need to do straight makeup as well as FX? Where do you live, what is the industry like- do you even have one? In terms of doing straight makeup in general, there are waaay too many beauty students out there anyway and half of the schools seem to think they can tack on a “film and special effects” module and people will line up to enrol. Which is kind of worse than too many doing a dedicated effects course because at least effects courses should teach you a tiny bit about what film involves with regard to script breakdowns and timeframes and practicalities of being on set. Where I live, I can specialize and nobody else really offers that here. There is a lot more competition in some places, but then there are a lot more people to learn from too. I hope I have disillusioned you. By which I mean that I hope if you had any illusions before about what was involved, they are now gone, and you can see clearly the path ahead of you. I hope you understand that Im not trying to discourage you, unless your heart really isn’t in it, in which case I definitely am. I hope that everything I have said has just made you even more determined to follow your dream, no matter what it takes, no matter whether you get there in the end or just have a damned good shot at it before you change your mind, because you only get one life and one chance to do this. Regardless of the downside, and there will be one to any career, I believe that if there is something you are really, really, REALLY passionate about, (and that lets most of the wannabes out-) then you should, you MUST, give it one good shot at least. You won’t be lying on your deathbed regretting the things where you tried but didn’t quite make it… You will however regret never having tried in the first place, and theres nothing worse than living never knowing if you might have made it or not….. Continued in So You Want To Be A Makeup FX Artist Pt 2: Breaking out and Breaking in….. This entry was posted on Tuesday, July 24th, 2012 at 11:26 am	and tagged with Arts and Entertainment, effects, film makeup, learn makeup, learn sfx makeup, make-up artist, Make-up FX, Makeup, makeup and hair, Makeup Effects, Makeup FX, movie makeup, sfx, special effects, special fx and posted in Life, the universe and everything..., THE BUSINESS OF MAKEUP FX. You can follow any responses to this entry through the RSS 2.0 feed. « How Time Flies… The Intensity of Creativity….